Feb 28. It’s my birthday and Ill cry if I want to…. 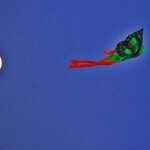 By now you know that I have a fascination with birds and the moon. 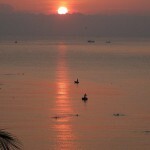 Today is full moon in Nhatrang and in Europe and the Americas. But in Australia, New Zealand and Beijing it will be tomorrow, March 1st and this means that this part of the world will have the second blue moon in the same year,in January and in March, a rare occurrence. I purposely switched to the bay view room to get a good picture of the moon rise. And guess what? I just got totally engrossed in an article I was researching that I caught the moon a half hour too late and then my camera battery was dead… I’ll try again tomorrow but I am afraid there will not be enough daylight then to get a horizon. My next opportunity will be at Lisa’s in March with the Cascades as the horizon. The below moon shots were taken on the 27th. 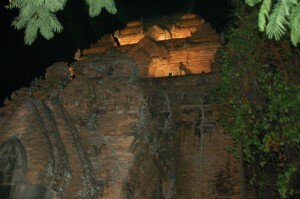 My previous one was in Luang Prabang, Laos, on January 30, the Blue Moon. Today also happens to be my twin brother’s 73rd birthday. I celebrate my 65th because I have been at sea 4 years since 2005 and for every year at sea one goes backward one year. Another rare re-occurence, February 28 in 1937 was also a Sunday. Sunday’s Child is full of Grace…. I received a number of well wishes but the 5 children and several family members and friends are in deep doo-doo. I’ll just cry and pout for a while and then I’ll be looking for a few urchins here to write into my generous will. It will also save me a heap of dough on the gold and precious stones I was going to bring back for them. 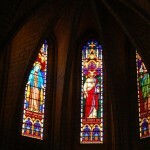 I went to 9.30 mass at the cathedral “Christ le Roi”. Though I do not understand the sermon I feel totally connected to my brothers and sisters and my Maker and my King. There are so many distractions here that keep me from digging my head into the material that I brought to work on, to write into an article and stories. I prefer to just ride around on the bicycle and take in the life that is played out on the water, streets and in the back alleys. I had such a great salade Nicoise, for lunch, at “Le Petit Bistro” yesterday that I had to get another one today. The anchovies reminds me of the best meal I have ever eaten aboard “Fleetwood”, when Lynne cooked clam linguine with anchovies on the Intra Coastal Waterway. I met a young couple, Bryan and Kara Ruhl who teach/council at the American International School of Guangzhou, at the “Petit Bistro”. Kara grew up in Skagit County, near where “Fleetwood” was built. 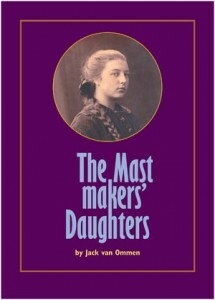 Mattie, my last wife, was once considering teaching at this school, she was born in Guangzhou. 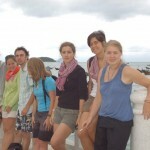 Back in 2006 I used an agency in Nhatrang to do all the customs and emigration formalities. But the address and phone number are no longer to be found. I went to the immigration office in the old port and they were able to put me on track. I also visited another agency that can perform the same services. 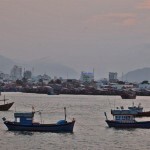 This way I can give a few options to any interested cruisers planning a visit to Vietnam. I was told by the Vina Line agency that the astronomical fees that I had to pay are mainly due to the “tips” they have to give to the government agents who process the clearances. This is an incredible system. The Vina Line agency and apparently the Falcon agency I used are all government owned companies. So one pocket fattens the other. 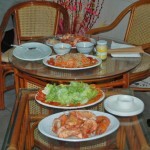 Last night, Maie, the Vietnamese Canadian wife of the hotel owner prepared this fabulous feast of jumbo shrimp. See the below picture. The fish comes fresh right off the beach. Maie made 5 failed attempts to escape from Vietnam when she was 19 years old, which resulted in jail time when she was caught by the police. 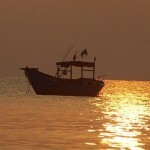 She hid in the caves on shore and then rowed in a basket boat to make rendez vous with a fishing boat in the bay. They made it to the Philippines, weathering a storm where they had to constantly bail to stay afloat. She awaited acceptance to Canada for three years in a Philippine refugee camp. 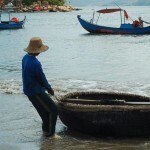 I spent most of the day trying to find a place around Nha Trang where I can watch the basket boats being made. I am getting closer. Without a good English speaking Vietnamese guide on my bicycle it resulted in many dead leads, even though I had it written down by a Vietnamese in my notebook. 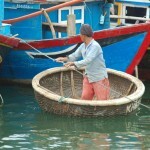 I was directed to the basket boats in the bay and finally to a merchant in the fishing village that sells brand new ones. One sight I had not seen yet was the Lon Son Pagoda. 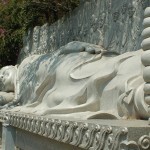 It has an enormous reclining white Buddha. It also has a memorial for Thic Quang Duc who was the first self-immolator, protesting the treatment of the Buddhist by the Ngo Dinh Diem regime, in 1963. Six emulators of the immolator are immortalized in the same memorial. The horrid photograph of Quang’s desperate act lives vividly in the memories of my generation. On a fluke, I decided to stop at the Louisiana Brew house beach, which has a swimming pool, beach chairs and umbrellas and it rents out Hobie Cats, Windsurfers, etc. When I asked the Australian looking operator of the water sports section: ” Do you know what happened to Allan Goodman?” there was a momentary puzzled look and then he said: “You are looking at him”. I had met Allan in 2006 in a different uniform, this time his “costume de jour” is a Speedo. It was good to see him and Allan was able to fill me in on just what had gone wrong on the highly touted entry of Sun Sail into Vietnam with a six boat sail charter fleet. And he gave me some encouraging news on the prospects that Vietnam might soon become a more attractive cruising destinations for sailors like my self. 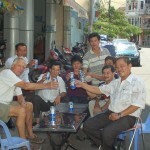 I wrote about my 2006 trials and errors experience at : http://cometosea.us/albums/log-Vietnam.htm I plan to write a section for www.noonsite.comon Vietnam with these latest details and addresses in the next couple of days. 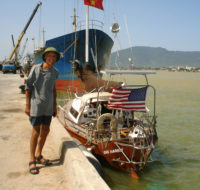 According to Allan “Fleetwood” is still one of the very few boats that has spent any appreciable time in Nha Trang in the last years. On the beach I met an ex-pat from Mumbai. We got to talk about “Shantaram” a 1000 page book about Bombay that I am halfway through with. 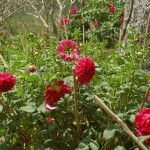 It has made a deep impression on me and I have been mentioning it to several people along the way. What I was not aware of, before meeting the Mumbaier, that the book was originally a much smaller one and that Johnny Depp (Pirates of the Caribbean) asked the author, Gregory David Roberts, what it would cost to have him write it into a screen play. He mentioned some crazy figure, in the millions: “Done” Depp answered. The movie production has run into many obstacles and eventually it will be an awesome event but, reading the book/movie script, Roberts makes you hear the sounds, smell the fragrances and stench, feel the pain and experience it’s love. You have got to get a hold of it! I ate dinner at the Texas Barbeque, run by a Texan. The ribs were fantastic. Brad the other Edmontonian guest at my hotel and his Saigon girlfriend, Thu, just happened to come in at the same time and we shared a table. I had an after dinner Pastis at Andre’s “El Coyotte” and met another Vietnamese-American repatriate, John. He knows where they are making the “Tung Chais”, basket boats, and will take me there. Where did I see this before, the Hermitage? The vicodin pain killers were not doing me much good last night and the tooth ache kept me awake for the early part of the night. I ended up going to the local Khanh Hoa Hospital, dental division. This was quite an experience. The halls were crowded and gurneys and wheelchairs where squeezed through Saigon traffic style. It would make a perfect movie set for a Florence Nightingale script. The dentists and a bevvy of dental students got right with me but then I had to take my turn in the X-Ray section. I had the X-Rays with me on a USB key that were taken of the teeth in question, last month in Saigon. But the hospital only uses the antique PC’s for their in house program. And they would not have shown the infection/abscess. I had to wait for a couple hours to get X-Rayed and the pictures developed with a long line of, mostly, traffic accident victims. The dentist prescribed the very same antibiotics, Rodogyl, which I bought over the counter, last Saturday. For the pain he prescribed “Tatanol Codein” ( 500 mg Acetaminophen 30 mg Codein) and they are working much better for the pain than the Vicodin. The 10 day medication cost me $ 10 and the hospital bill for the doctor and X-Ray came to $ 10.00……. Hooray for the Socialist Republic of Vietnam! Chúa O Cung tôi Trong Luc Gian Truan!” = ” O Lord be with me when I am in trouble!” This is today’s responsorial song in every Catholic, Episcopalian and Lutheran first Sunday in Lenten season service. The gospel and sermon were about Jesus’ 40 days fast in the desert. There are no English or French services in Nha Trang but all one needs to do is go on the internet to get the text of readings and gospel. And the liturgy is universal. I was raised protestant but prefer the predictability when visiting in countries where I am unfamiliar with the language. 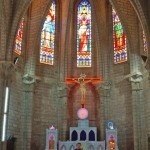 The Cathedral of Christ the King in Nhatrang is a neo gothic style building erected by the French and finished in 1934. It has excellent accoustics. The church was full and it is so good to see so many young people attend. Much of the liturgy is sung and sung well with everyone participating, by heart. It is so rewarding to be with my brothers and sisters of a people that have become so dear to me. It had Oeufs Benedicte at “Le petit Bistro” and a real cup of coffee, before mass. Early afternoon I went for a swim in front of the hotel. The tooth ache still comes and goes but went without pain killers since yesterday afternoon. For the last three days I have been bothered with a a nasty tooth ache. The last time this happened was between Papua New Guinea and Palau in January 2006. Far away from any dentist. I panicked and got some help by e-mail from my dentist and then it just went away. This time it comes and goes. I am taking left over Vicodin for the pain. 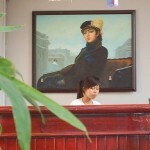 The Saigon clinic where I had my broken crown replaced, last month, was extremely helpful by phone and e-mail. I’m taking antibiotics as well. If the infection does not go away by Monday I’ll have to find a dentist. Saigon knows of none to recommend. The vicodin makes me a bit whoozy so I did not want to ride my bike in the (controlled) mayhem. There is an excellent piece about the Mekong River on National Public Radio at :http://www.npr.mobi/templates/story/story.php?storyId=123892203 that touches on the pollution of the rivers and ocean. The below picture is what the tourist or travel brochures avoid showing. Garbage disposal is a huge problem in Asia. You might remember that for large stretches of the waters around the Philippines, Vietnam, Indonesia it was impossible for me to stream a trap line because it would just catch plastic bags. Garbage cans in public places are rare. The way garbage is collected here is by depositing one’s trash in small plastic bags on the main road close to the side walk, in the evening. What’s left of it after the traffic has run over it and the rats and scavengers had their pickings is scooped up by hand in the early morning by the municipal garbage collection. The liquid wastes from restaurants runs out of the trucks and they occasionally stop over a storm drain to spew the garbage truck’s slush. I’ll spare you the smell. 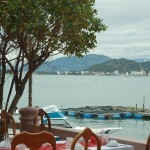 The restaurants around the hotel specialize in fresh sea food. 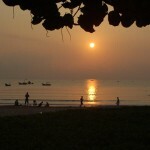 In the early morning the fishermen sell their catch right in front on the beach. These fisherman fish in small boats near shore with throw nets and bring their catch up on the beach in their basket boats. 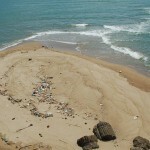 The catch is fished out of the nets on the beach and the plastic bags, beer bottles and unwanted small fish, crabs and crustaceans are left to smell on the beach. Thursday I had that wonderful eel lunch, last night I had small squids broiled in aluminum foil over a charcoal fire on the beach. 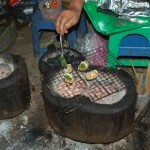 It was broiled in a superb sauce and herbs and then rolled in thin rice paper sheets with fresh lettuce, cucumber, mint. I sat on these kids play house chairs and a tiny table right on the beach with the surf breaking and washing the dinner down with a Tiger beer. I thought that I was going to be able to boast to the tourists that that I had eaten with the locals at this great bargain but it ended up at 78,000 dong or about $ 4.00, so, I didn’t. 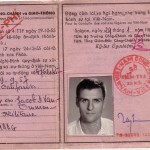 Yesterday for lunch, in town, the boss had time to talk and I brought out my 1962 Vietnamese driver license. When the bill came he reduced it by about 20%: “You get the Vietnamese menu prices!” The Vietnamese women want me back at age 24, when the picture was taken on the below driver license. This means that I have to come back to Vietnam in 2053. 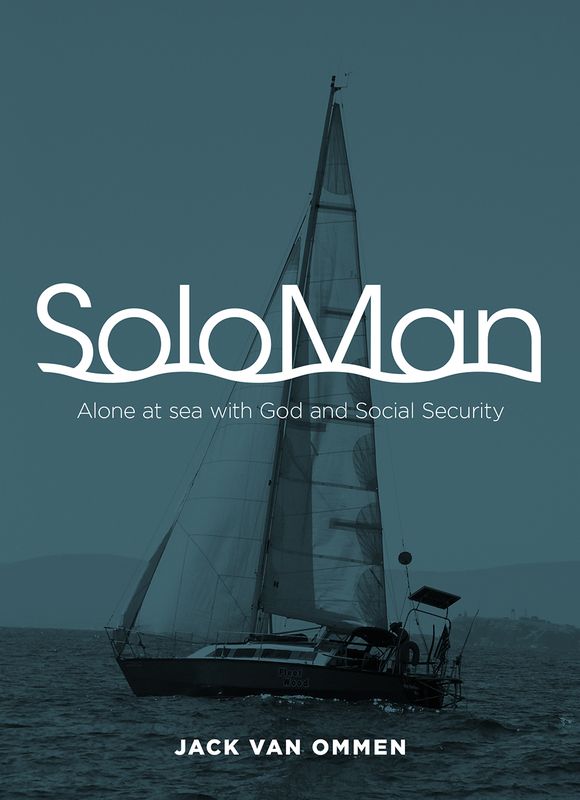 Because an ocean sailor rejuvenates one year for every year on the ocean. I started in 2005. After dinner I sat with Brent, the California/Texan on his ocean view balcony here in the hotel, same floor. 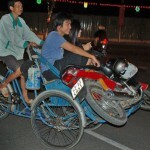 He and his wife Sunny are going back to China, via Hoi An, Hanoi, tomorrow. 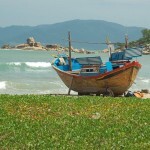 This morning I rode the bike to the northern edge of Nha Trangh. I met 6 young French ladies and Jean along the ocean boulevard. They are volunteers, teaching French in Saigon to disadvantaged and handicapped children, sent out by a French Catholic Charitable organization. 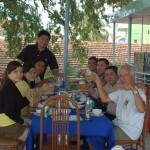 I hope to get together with them in Saigon, before my departure. And I like to ask Jean some questions. Like how did he manage to get rid of the other guys?? O.k, the free lunch. I came upon these seven men having a party. So I had to take a picture. Next thing, by now no longer a total surprise, I am invited. They are honoring the memory of their deceased mother, aunt. How I wished I knew more Vietnamese. They did not speak but three words of English. The food was outstanding, so was their company. On leaving I was given an incense stick to add to the others and make my lotus hands bows to the mother/aunt. I wish I would have my kids and nephews/nieces do this for me, when I pass away. Have a great party and eat good food. But then they might need to take up ocean sailing to be there when I kick the bucket at 150 years or more. The Vietnamese are absolutely # 1. I will always love them for how well they have treated me. Last night I visited with Andre at his bar/Tex-Mex restaurant “El Coyote”. He and Allan Goodman, an Austalian, were building a dock on the shore of the anchorage where I stayed in Nha Trang’s old harbor in 2006. The floats were destroyed in a typhoon that hit the area in the fall of 2008. I rode my bicycle out to revisit the anchorage. In order to get to the nice little sandy beach in the anchorage bay I now had to pay 60 cents entry fee. But the area has been cleaned up and there are now toilets and showers on the beach, that would have been very welcome to me in 2006. Just beyond the bay in the old port was a total traffic jam. A Russian-Vietnamese government venture has turned Hon Tre Island into a Disneyland like amusement park. A chair lift carries the tourists from the main land. 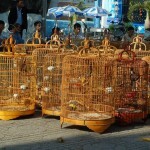 These last few days of the Lunar New Years week celebration are now drawing thousands of Vietnamese to this kind of entertainment. In 2006 the Russian financed projected, property and labor is bartered to the Russians in exchange of arms, was dumping tons of fill in the bay, without any concern of the environmental impact on the river delta. Now there are fancy country club style mansions filling the fill. A large bill board shows the layout with a marina. But the difficulty of getting a permit from the government for every destination a pleasure boater might like to chose keeps these waters void of any private pleasure boats. 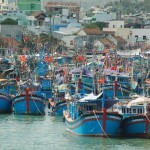 The Viet “apparatchiki” are litteraly missing the boat in their paranoia to control the coast line. You might remember the spectacle of the drying fish on the river banks in my 2006 album. The screens were there but not a single fish being dried. This due to the holiday week. I also revisited the spots where the fisherman were hauling out their boats for maintenance. The ways were empty. Whenever I rode up some of the back streets there were card games going on. 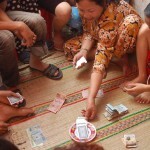 Playing for money is against the law but during Tet week the police is looking the other way. I saw this little girl just piling in the Dongs. Usually you only see men playing cards but every one was at it today. I emptied out the contents of my back pack and hung my shirts on coat hangers for a change. The room is quite nice. I have to twin beds here so if any one wants to come for a couple of weeks and celebrate my 73rd, and split the $10 room bill. So far, So good. I was holding my breath, worried that the memories of Nha Trang from my 2006 visit on “Fleetwood” might turn out into a disappointment. That the town would have been turned into another Vang Vien or Disney Land. There are definitely more tourists,hotels and traffic but the beaches and blue ocean andthe fishing fleet have not changed. The sleeper bus arrived in the early morning. The first couple of hotels I tried wanted anywhere from $30 to $50 a night. They were still taking advantage of the holiday rush. I found a $15 room. No fridge, no a.c. The usual coffee at most cheap Vietnamese breakfasts is a nasty mixture of instant coffee and unspecified chemical fortifiers. 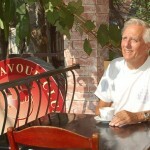 So, I stopped afterwards at “Le PetitBistro” for real coffee. There I made the acquaintance with Brent a Tex-Frisco semi permanent self imposed U.S. exilee, married to a lovely Chinese, younger than his son by a previous marriage. This might shock a few people in my home town but this is a “au jour” among the semi permanent mixed couple circuit in Saigon. I met one American whose new Vietnamese mother in law is younger than his daughter from his first marriage. He gave me the name of an Edmontonian, Owen, married to a Vietnamese Canadian. 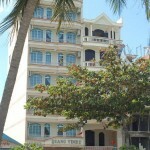 who owns a hotel on the beach on the northern edge of Nha Trang. I bought a mountain bike from the hotel where I am staying. She wanted 1,7 million dong. Or about $95 we settled on 1,3 million and then I had to replace the brake and derailleur handles and buy a cable lock and still ended up in the $90 range. But renting a bike for nearly 30 days would have cost me $ 60 and I should be able to get at least $50 on resale. 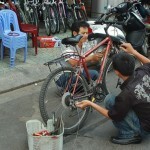 I bought a brand new (Vietnamese not as good as this bike)bike from the same shop that fixed my brakes/gears in 2006. That bike crossed from Vietnam to Malaysian Borneo and was stolen in Kudat in May 2006. My next bike was bought in Bali andstolenin Durban. Then Bob Ellsworth gave me folding bike in July 2007 and it was stolen on my birthday Feb 28 2009 in Puerto Rico. Next, Greg and Marlys Clark gave me another folding bike in Fort Lauderdale on April 2nd 2009 anditis locked with a chain half the weight of the bike in Amsterdam. After the two young men had replaced the brake handles and gear shifts there was a good reason for a : “Mot, Hai, Ba (1-2-3) “Yohhhh!” party. See the below picture. Everyone is still in the New Years celebration mode. And little serious work is accomplished. The main businesses and government offices do not reopen till this Monday. The family obligations and prayers and offerings in the temples have been done andnow it is more going around andvisiting old friends in the neighborhood you grew up with. Yesterday, saying good bye to my Vietnamese-American friend Mike, I learnt once again how small the world is. Our, the Tacoma van Ommens, favorite restaurant is Vien Dong (translate: Far East) restaurant on 38th and Tacoma Ave. in Tacoma, Wa. It has, to my taste, the very best Cha Gio ( spring rolls) in the U.S.A., as a matter of fact, since I left Saigon in 1963 I have not even tasted any better here in Vietnam. On June 1st 1994 daughter # 2, Rose Marie, broke her water of her first child while having lunch with me and my visiting twin brother Jan and his wife Catharina at “VienDong”. Now it turns out that my new friend Mike started the restaurant and sold it to the current owners in 1991…… Mike is coming to the N.W. 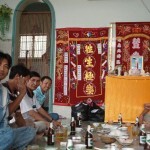 in April when I will be there and we will, for sure, all go and all have Cha Gio at “Vien Dong”. 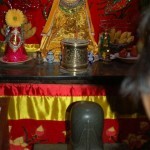 After lunch I went to visit the Po Nagar Cham Towers. This site was used as early as 200 A.D. and the current temple dates from between 700 and 1200 B.C. 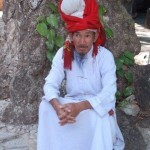 The Chams were Hindus and many of the ethnic Chams in Vietnam andCambodia now practice the Islam religion. 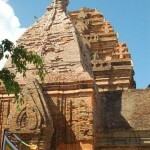 (See my blog around Jan 18 when crossing into Cambodia). 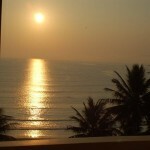 The weather here is cooler than Saigon and there is a very pleasant breeze coming form the ocean. I know I will like my stay here.